We’ve been living in Sunnyside since last July (2007) – Kensington is just a short walk away and downtown Calgary is just across the river. it’s great to have so many restaurants close by. After passing by the Broken Plate in Kensington so many times, we finally decided to go try it out last Wednesday night for dinner. In terms of price, I wouldn’t say Broken Plate is expensive, but it might be for those on a tight budget. We had a very big meal for three including two appetizers, one dessert, two coffees and a bottle of wine, all which came out to a total of $150. For what you get in terms of portion size and quality, I would say that it’s very reasonably priced. But in terms of value, I think I would have felt much more positive about the experience if the service had been more memorable. By the end of the meal, while I didn’t find anything that would make me not go back, I also didn’t feel any motivation to go back anytime soon. I had heard good things about Broken Plate and I suppose I was expecting to be blown away, but I was disappointed that I was only satisfied with my meal and with the experience as a whole. There was nothing about it that made me want to tell all my friends… But in case you’re wondering about Broken Plate, I would say, yes, it is worth going to, just don’t expect to be wowed at all. 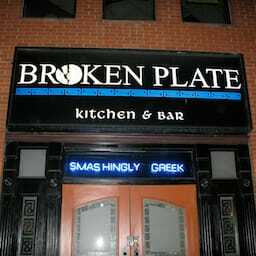 Broken Plate Kensington was published on Wednesday, March 26, 2008 at 2:43pm MDT by Daniel Menjívar and last updated on April 11, 2018 at 9:30pm UTC .